A few months ago, Apple unveiled its 9.7-inch tablet. It is more portable than 12.9-inch one and offers better experience than other models do. You can use it as a computer to edit files, design slide shows, and you can capture high-quality pictures, which is really amazing. However, higher-resolution images take up more storage space, so you need to free up some space for new photos. What’s more, some people would like to back up important pictures to their computers. Thus they are searching for solutions to move photos from iPad to PC. iTunes is the most common way, but for Windows users they have to download iTunes on PC. And images will be deleted every time after syncing. Are there any better solutions instead of utilizing iTunes? Of course. Read this article and find a way you like. AirMore is a free app that helps both Android and iOS owners to transfer their phone files wirelessly. And with its powerful functions and user-friendly design, you can easily manage documents, pictures, videos and music of your tablets and phones and it is compatible with Android, iOS, Mac and Windows. It needs little space but can save more space for your mobile devices. Now follow the steps below to transfer photos from iPad Pro to PC. Go to App Store and download the app on your iPad. You can also click the button below. On your PC, go to airmore.com/web.html. Open the app on your iPad, tap “Scan to connect” and scan QR code on computer screen. When a prompt pops up on your iPad, click “Agree”. Use “Pictures” function on AirMore Web and select images you need. 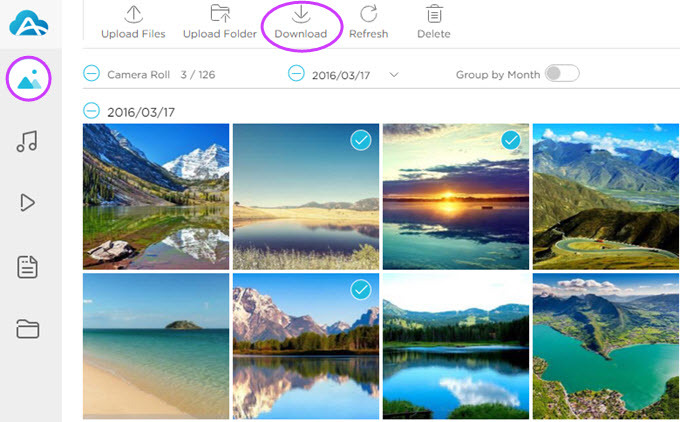 Click “Download” and select a folder where you want to store your photos. You can quickly copy numerous pictures from iPad as long as your network condition is pretty good. You can choose images you want rather than sync all photos. And you can get pictures without erasing them. But remember, to guarantee the successful connection between iPad and PC, you have to make them linked with the same Wi-Fi. Windows 10 was released with some new applications and Photos is one of them. It allows people to view their pictures on PC, enhance photos to make them look better and transfer images from one device to others. 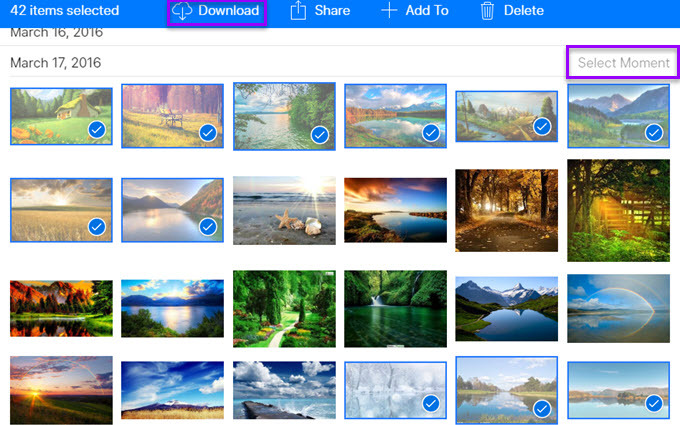 And with the help of OneDrive, you can see photos uploaded from other devices. Let’s have a look at how to import photos from iPad Pro to PC with this new software. Utilize a USB cable to connect iPad to PC. On the computer, Click “Start” icon and find “Photos” under “All Apps”, or use search tool beside “Start” to search for this application directly. Tap the download button on the upper right corner and select the photos you need. Click “Continue” and then tap “Import” to start. In this way, iPad users can get new photos that are never imported to PC before. When you want to transfer certain items, you need to unselect others, which is inconvenient if there are a huge number of items. And Photos is a new choice only for Windows 10, while users of other Windows versions could use Photo Gallery application in your PC or transfer with the help of “Import pictures and videos” under the “Portable Devices” of “Computer”. iCloud can help you move photos from iPad to PC because when you upload iPad photos to iCloud, you can download selected items to your computer with the same Apple ID on iPad. Such cloud service could help us back up a large amount of data without eating up disk space on devices. Below are details. On iPad, hit “Settings” and open “iCloud” to log in your account. Turn on “iCloud Photo Library” and related options. Go to iCloud.com and log in the same ID of iPad on your computer and click “Photos”. 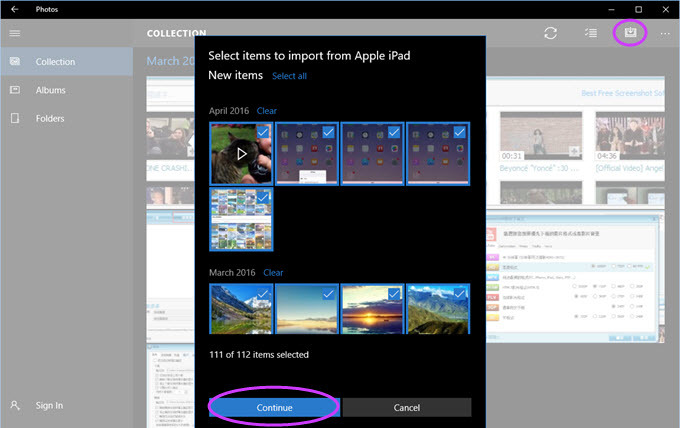 Tap “Select Moment” to choose pictures and click “Download” to transfer iPad photos to PC. You do not need to install any application with this method, and it also works wirelessly. But it will cost you some money when your iCloud storage is running out. Although you can select pictures to be imported, you can’t choose what to be uploaded to iCloud. And if you store a large number of items, it needs time and patience. The methods mentioned above are easy to follow, and you can find one for your iPad. As we can see, the second way needs a cable to connect iPad to PC and you might encounter some connection problems. And the last method takes time and money when you have lots of files on your iPad. But with AirMore, you can transfer photos from iPad Pro to PC nearly without limitation. Also you can use this app to transfer photos from iPhone to computer. What’s the Difference between iCloud Backup and iTunes Backup?